1. If you had to wake to one song on your clock radio or cell phone dock every morning for the rest of your life, what song would you choose and why? Definitely “Don’t Stop Believing” by Journey because it took many years between writing my first book and its publication, but I never stopped believing. Besides, who wouldn’t want to wake up to Steve Perry singing to you? 2. Since one of our September guests is also the author of a nonfiction book on writing (Debra Dixon), name some of your favorite books to help writers. I saw Debra Dixon’s post on your blog and ordered her book. 🙂 Stephen King’s ON WRITING is at the top of my favorites list. Even though her book is not strictly on writing, Elizabeth Gilbert’s BIG MAGIC truly inspires me. 3. Favorite TV hottie: Neal Caffrey (Matt Bomer) from White Collar, Jackson Avery (Jesse Williams) from Grey’s Anatomy, Angel (David Boreanaz) from Angel or Derek Morgan (Shemar Moore) from Criminal Minds? Tough choices, but I have to go with Matt Bomer/Neal Caffrey partly because I love the premise of White Collar. May I also nominate Ross Poldark (Aidan Turner) from Poldark? *swoon*. 4. In which genres and subgenres have you been published, and what does your narrow or sweeping focus say about you? I’ve been published in historical romance and mystery with romantic elements. I have also published poetry. My sweeping focus illustrates my love for diversity in what I read and write or that I’m ADD. Which I am. 5. Is social media a bad habit for you, and, if so, what is your favorite time drain? Often, I won’t allow myself to launch Chrome until I’ve fulfilled my writing goals for the day because social media is a black hole for me. Facebook is my weakness because my family of origin lives in Rochester, NY, and my daughter and grandkids live in Houston (they made it through the hurricane unscathed). Facebook is like visiting with family. But what really gets me is marketing opportunities for writers. It’s like following a trail of bread crumbs and suddenly it’s midnight. 6. Name the most embarrassing concert you’ve ever attended? Middle school beginning band/orchestra. All of them. Yet, I had tears in my eyes. 7. Which is your preference to write: love scenes or murder scenes? My murder scenes are not gory, but I enjoy writing the suspense that leads up to them. Love scenes are always fun to write. 8. Name one thing you wish you could change about yourself. No more plantar faciitis. I want to wear pretty shoes. 9. Favorite autumn activity: roasting marshmallows by a fire, driving miles for fall-leaf tours or cuddling with a special someone for an indoor movie marathon? Love to cuddle. My daughter called one evening asking if we wanted to join them at her friend’s for a drink. We had just settled in for a movie and were in our pjs. I said, “No, we’re watching a movie on Netflix, so we’re just going to chill.” She had to educate me on what I’d just said. LOL. 10. Name a theme you often see popping up in your stories. I have this epigraph by Lao Tzu in the beginning of my current book: “Being deeply loved by someone gives you strength, while loving someone deeply gives you courage.” I think that is an overarching theme in all my books, romance and mystery. 11. If you had no audience, and no regrets would follow, what midnight snack(s) would you be gorging on tonight? Chocolate cupcakes with chocolate frosting. 12. What was the lowest point in your writing career, and how did you recover from it? Writing my fourth book, BURIED SECRETS, was misery at one point. I wrote it during NANOWRIMO, which is antithetical to my process, so at the end of the month I had a crazy-quilt book, and I’m a linear pantser. I sent it to my beta readers way too soon, so I had more suggested revisions than I knew what to do with. I put that book away three times, never intending to return to it. I couldn’t see how to fix it. But it kept nudging me, and my editor, Julie Sturgeon, helped me stitch it together beautifully. 13. With no money limit, if you could construct the most perfect writing space, what would it look like? I remodeled my office last year and I love it. All it needs is a lounging sofa and a wet bar. 14. If a director made a movie about your life, which actress (living or dead) would you like to portray you, and which one would more likely be cast? Too funny. This is a conversation my family often has. I would like Annette Bening to portray me (young Annette Bening, of course), but my daughters say Annie Potts. 15. When you’re not writing (or working a day job), what are some of your favorite ways to spend your leisure hours? I like to golf, hike, swim, and read. An ideal day of leisure would be on the beach. I love to travel. “It is a beautiful evening, Captain Brentwood. Shall we step out onto the terrace?” she asked trying to steady her trembling. It did not help that the room seemed to be moving, too. The half-moon perched on a treetop, and the stars sprinkled across the ebony sky. They walked silently out to the garden, the smoky smell of well-stoked fires filling the crisp air. Emily felt a little steadier. They sat on a bench beneath a tall oak. “By all means, Miss Wentworth,” Jonathon smiled. “I do not want to go to Virginia with you any more than you want to be burdened with me. I fully intend to stay here with my brother. Father’s intentions were good, but he was wrong to do this to either of us, and I believe you see the sense in this, too.” Emily folded her hands in her lap as if to end the discussion. Emily felt a new rush of warmth course through her that had nothing to do with the brandy. She knew he was teasing her, yet she tingled with excitement. Just the thought of his soft lips against hers, being held in his strong arms…what was she thinking? She stood quickly. “Why ever not?” she cried near tears. 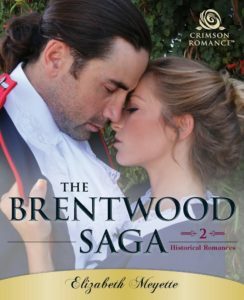 THE BRENTWOOD SAGA, a bundled release of two complete novels, LOVE’S DESTINY and LOVE’S SPIRIT, is a July 2017 release from Crimson Romance, part of Simon and Schuster Digital Sales, and may be purchased from these retailers: Amazon, Barnes & Noble, iTunes, Kobo and Simon and Schuster . Believer in dreams-come-true and self-confessed chocoholic, Elizabeth Meyette is the author of four novels. THE CAVANAUGH HOUSE and its sequel, BURIED SECRETS, are mysteries set in 1968 in the Finger Lakes region of New York State. LOVE’S DESTINY and LOVE’S SPIRIT are historical romances set in colonial Virginia and are available together in THE BRENTWOOD SAGA bundle. 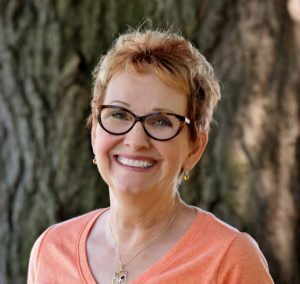 Elizabeth is an Amazon Best-selling author, a PAN (Published Authors Network) member of Romance Writers of America, a member of Sisters in Crime and a member of the Society of Children’s Book Writers and Illustrators. Before pursuing her writing career full time, Elizabeth taught English, Journalism, and Library Science/Technology. After retiring from teaching, Elizabeth embarked on her writing career full-time and, in addition to her four novels, has published poetry, magazine articles and her blog site, Meyette’s Musings. A friend said of her, “You haven’t retired, you’ve refired!” She is currently working on her fifth and sixth novels. Elizabeth and her husband, Richard, live in west Michigan where they enjoy the beauty of the Great Lakes. They have an agreement that she cannot cook on writing days after he endured burnt broccoli and overcooked chicken. Fortunately, Richard is an excellent cook. Stay in touch with Elizabeth through her Website, Blog, Amazon Author Page, Facebook. Twitter. 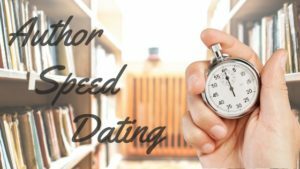 Goodreads, Pinterest and Linked In.